Jeff is the Founder and Chief Story Debunker of The Nischwitz Group, a speaking, consulting and coaching company that transforms people and organizations… one story at a time! Jeff helps businesses accelerate revenue, develop effective leaders, nurture high performing teams, and execute on their objectives. Download Jeff’s speaker information in PDF format. Beginning as a successful lawyer, Jeff first modeled courageous change when he left the corporate law firm where he was a partner to take the leap into entrepreneurship by creating his own law firm. 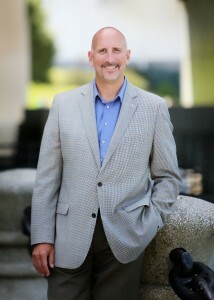 After building and growing that firm into a northeast Ohio success story (on a foundation of a clear why and a different way of a law firm adding value to its client), Jeff did what few dare to even consider: he left that which he knew and which was successful to go in search of his true calling. For Jeff, getting by or merely succeeding without loving what he does was not acceptable. Like many entrepreneurs, Jeff’s journey had many twists, turns and yes, stumbles, which Jeff openly shares and speaks on as part of his authentic story telling – the good, the bad, and sometimes the ugly. After several years of trying to “fit in” to the traditional corporate and business world, Jeff once again leapt into his life when he founded Think Again!, which has now evolved into The Nischwitz Group. As one colleague said of Jeff, “Jeff is a rare individual with high standards for the organizations and people he works with. If he does not feel the fit, he has the courage to makes changes designed to move him to his true calling and to fan his passions. Click to learn more about The Nischwitz Group’s Unleashing Conscious Leaders and Accountable Teams programs. The one foundation of everything that Jeff has done the past 15 plus years is what he considers the secret sauce for business and life – the magic of relationships. We all know that relationships drive results, and Jeff has been helping businesses, teams, and people build extraordinary relationships with prospects, clients, team members, and themselves. After launching a Relationship Revolution with strategies and approaches for building genuine and mutually beneficial relationships, Jeff’s personal transformation has led him, his clients, and thousands to a new way of being, leading, and living in the 21st Century. Click here to learn more about The Nischwitz Group’s Unleashing Rainmakers programs. Often challenging, Jeff Nischwitz is a master inquisitor with the rare ability to ask questions that go beyond the heart of the matter, into the soul of a person and even an organization. So skilled and intuitive are Jeff’s questions, that his seemingly innocent inquiry, “Do you mind if I ask you a question?”, often comes with a warning: Be careful before you say yes, because you may learn, experience, or uncover something that you were not expecting … and perhaps something that you had never seen or known before. This is just one of the many gifts that Jeff brings to the people and organizations that are ready for transformational change. Click here to learn more about The Nischwitz Group’s Unleashing Lives programs. Jeff is also the Author of Think Again! Innovative Approaches to the Business of Law (American Bar Association 2007), offering innovative and practical advice on building an exceptional law firm, including empowering your people, building successful teams, and adding value to pure legal services. Jeff shares his unique perspectives on building a great law business, including secrets of effective selling through existing relationships, how to take advantage of everyday opportunities, and consistent and reliable ways to get (and keep) new clients. Think Again! 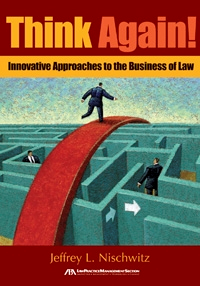 Innovative Approaches to the Business of Law is available at www.abanet.org/abastore and via other online book resources. Jeff is currently working on his second book, which is scheduled to be released in early 2014. Big in stature and bigger in heart, Jeff Nischwitz is a giant in authenticity, leading audiences on a magical journey of self awareness and discovery that is transforming organizations, leaders, teams, and people. As a national keynote speaker and master facilitator, Jeff energizes audiences across the country and challenges people to take charge of their businesses and their lives. You’ll laugh, you’ll cry, you’ll challenge yourself, and you’ll leave with the tools and different thinking you need to transform your business, your relationships, and your life. Jeff captivates audiences on a wide range of topics including conscious leadership, accountable teams, relationship building and business development, the power of questions, overcoming self-limiting beliefs, and connecting to your authentic story. At the core, Jeff empowers audiences to overcome the stories that are holding them back. Click here to learn more about how Jeff is Waking Up Audiences across the country. Jeff’s audiences experience disruptive thinking, challenging questions, vulnerable sharing, and inspired perspectives on the impact of stories in their business and their life … an experience that has been called Getting Jeffed! Are you ready to unleash? To unleash your team, your organization, your leadership, or your life, complete our Booking Inquiry Form or contact The Nischwitz Group via email or 216.956.6587. 1. Jeff delivers new ways of thinking, new ways of approaching relationships and the tactical drivers to achieve sales success. 2. Jeff helps you accelerate your business by inspiring and empowering your team to build relationships with clients, prospects, strategic partners and team members. 3. Jeff energizes and aligns your teams for enhanced communication, accountability and execution … resulting in accelerated business performance. 4. Jeff shares a model for conscious and authentic leadership that will transform your business. 5. Jeff has a gift for asking deep and critical questions and helping leaders and owners unleash their potential into their businesses. If you would like more information on Jeff or would like to book Jeff for your event, please fill out the form below! You may always contact us at 216.956.6587.
Who will be in attendance? How many attendees do you anticipate? What is your budgeted amount, or range, for the type of services you are inquiring? What other information or comments can you share that would be helpful for us to know before contacting you? Once you submit your inquiry, we will respond to you within forty-eight (48) hours to schedule a telephone conversation to learn more about your key objectives and desired outcomes.